The 100 continues to explore the available options now that they are merely 10 days away from certain death by radiation. I’ve mentioned in previous reviews that this show has a preoccupation with Doom. I’ve never said it in quite those words before but the sentiment is a common one from me. The biggest problem for me is that every episode heralds some kind of “last hope” that is dashed before something else comes along. This formula has become really tiresome because it’s obvious that something else will come along pretty much right away. We have that to deal with on two fronts on this episode. The first is the ongoing search to find a way to turn everyone into Nightbloods so they can survive the radiation. I’ve praised this plot in the past because it lets different characters interact and the setting is an interesting one when contrasted with the normal visual style of the show. Last week had Emori throw an unfortunate anonymous Grounder under the bus to keep herself out of consideration as a test subject. As such we have an expendable person that the audience has no connection to offered up as a potential sacrifice to service the “greater good”. It helps that this particular Grounder is seen as deserving of this treatment because of the lies that Emori told. In short the procedure doesn’t work and all the characters can do is look on horrified as another “last hope” fails. With that comes the truth about what Emori did which unwittingly puts her as the next test subject. In effect she engineered herself into that position though there’s no way of knowing that she wouldn’t have been offered up as a sacrifice anyway. She’s the most likely out of all of them in terms of status within the show’s cast of characters so it seems likely. It does turn out that continuing the experiments is worthwhile because some kind of additive designed to prevent blood clotting got in the way of the Nightblood infusion. The “last hope” quickly becomes another “last hope” and a new sacrifice is needed to test the procedure. This show loves to present difficult moral questions and choices that aren’t easy to make. That’s something it has always done well and the writers have been known to not always take the easy way out when it comes to exploring them. None of that has really changed but the stakes are too high at this point to let any of it really sink in. Obviously Emori doesn’t want to be used as a guinea pig for a procedure that will likely result in her death and the other characters are clearly going to be conflicted about it. We’re not quite at the point where human life has been devalued to the degree that it is thought of as a resource as there is still compassion. Nobody likes what they feel they have to do but there is a willingness to do it. Do ethics have any place when certain death is so close? It’s something that could be debated until the end of our world but it’s a very practical question where this particular show is concerned. Some are willing to give up their humanity in the name of survival and Abby says it best when she declares “First we survive. Then we find our humanity again.”. It’s cold but her position on it is clear. Arguably holding on to your principles is meaningless when immoral actions could create an opportunity for the survival of a species. The counter argument to that is around what is actually being saved? If everyone compromises what makes them human to order to survive then that could be seen to be too large a cost. Coming back from that would certainly be difficult and the debate is a difficult one. In this particular scenario, Emori doesn’t want to die though she’s going to end up dying whatever happens so is she fighting for the chance to live out the remaining 10 days or does she think that other people deserve to be sacrificed over her? She was clearly willing to offer up someone she didn’t know in exchange for her but everyone around her she has some sort of pre-existing relationship with. I imagine she is purely motivated by fear and seeing what could be her very near future will only intensify that. Luna’s position on it makes sense based on what we know about her. She doubts that the procedure will work so refuses to have her blood used to put someone else through that. When she is reminded that it their only hope she points out that as far as she’s concerned the blood is a curse and this episode only strengthens why she would think that. 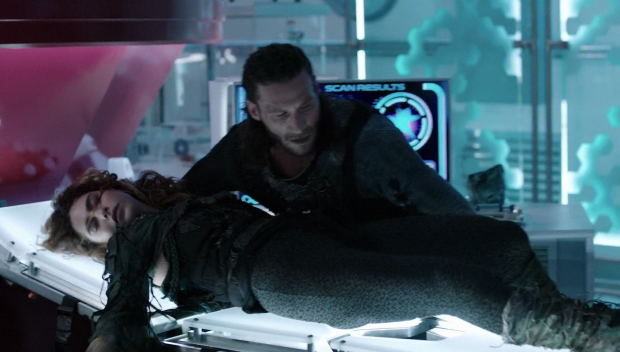 Roan makes the tough decision to force her to give up her blood which is fairly cold but also easy to understand. He’s looking out for the people he leads and sees a few lives an acceptable price to way for the survival of all of those people. The fact that he regrets having to force Luna into doing this shows that he isn’t completely detached and Zach McGowan plays that distinction well. Raven’s opinion on the matter is really cutting. She sees people being forced into experiments against their will and references Mount Weather. In Raven’s eyes what they’re doing is no better than what Mount Weather did and it’s important that nobody thinks there is some kind of higher moral purpose to this because all morality has been stripped away in the name of survival as far as some of the participants are concerned. Sadly this feels somewhat meaningless when Clarke decides to use herself as the test subject. This does makes sense from Clarke’s point of view because it ties into her style of leadership. She is willing to sacrifice herself to protect her people rather than sacrifice her people to protect herself. It’s as noble as can be under the circumstances and makes for an easy out for her character in terms of making the decision. Unfortunately it has the narrative problem of removing the stakes because it’s fairly obvious that Clarke won’t be killed. Abby’s destruction of the chamber is something I didn’t see coming admittedly and that did raise the stakes somewhat but it cheapens the whole thing. Clarke’s sacrifice is meaningless because she doesn’t actually have to go through with it which makes it a manipulative way for the show to have a consequence free shocking moment. 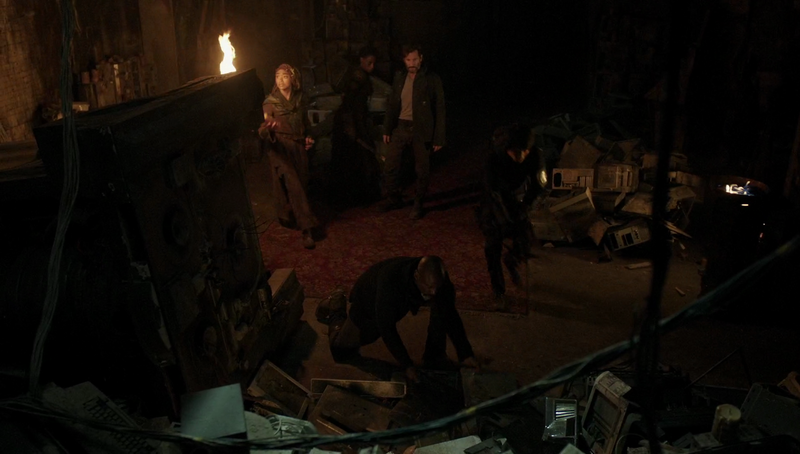 The fact that the other characters didn’t seem bothered when Abby destroyed the chamber doesn’t really ring true either. Bellamy and Jasper taking a stroll together was a really interesting pairing to have at this point after the characters have changed so much. The mechanics of getting them together felt a little forced but the content itself was pretty strong. Jasper has pretty much accepted his inevitable death and is taking it upon himself to live life to the fullest. This involves taking drugs in some part because there isn’t much time left to worry about the consequences. Bellamy is still hopeful while also seeking redemption but Jasper is able to get him to consider why he’s beating himself up about it. He has less than two weeks left to live so what’s the point in obsessing over past mistakes? What’s done is done and can’t be taken back so it’s the last thing to be hung up about when there’s so little time left. Jasper’s outlook is fascinating because he’s so self destructive. As I’ve said before it gives him peace and a sense of clarity that he hasn’t felt in a long time. His attempt to pass that clarity onto Bellamy might not work but it at least gives him something new to think about. It may not be especially profound storytelling and it doesn’t really go anywhere but it’s a good excuse to get these characters interacting. The other “last hope” is discovered by Jaha when he concludes that access to the radiation bunker would only be rewarded to those who reached level 12 of the Pyramid Scheme/Cult. I liked these scenes because it expands on the show’s overall mythology while also allowing for important character interactions for Jaha, Kane and Indra. I really liked Kane’s point about politics being pointless at this point because people are fighting for a community that won’t exist in 10 days. As far as he’s concerned they should unite as a species and work through this together but Indra’s warrior ways aren’t so easy to cast aside after a lifetime of living by that code. This plot is important for Kane and Jaha because it shows Kane trying to become a good leader while Jaha progresses as being something of a religious leader for the group. He’s the character that has faith and leads them down more spiritual paths. This whole plot is about taking a leap of faith to find salvation and it almost seems Biblical. Referencing things like Raiders of the Lost Ark and Lost with lost temple and mysterious hatch is a nice touch as well as it allows the writers to play around with a slightly different format and have some fun with the varied storytelling opportunities these things bring. It’s also good to have a little hope among all the doom and gloom which hopefully won’t be dashed within the first five minutes of the next episode. An uneven episode that raises some interesting moral questions but also recycles the same tired “last hope” storytelling that has plagued so much of the season. As I’ve said before when everything is the “last hope” and we’re quickly furnished with another then it become meaningless as far as stakes go. It did allow for some interesting moralising among the characters and an interesting debate about compromising humanity in the name of survival was allowed to happen complete with cutting comparisons to Mount Weather. 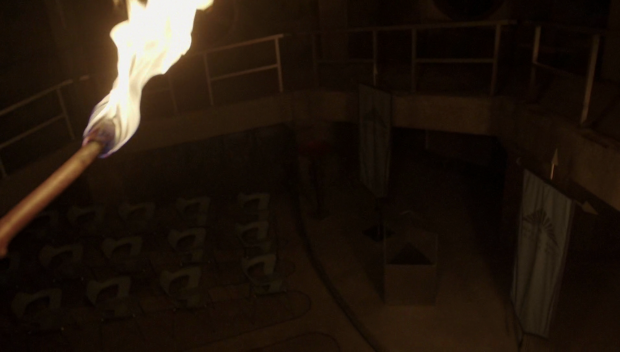 Clarke’s sacrifice says a lot about her as a leader when she is willing to die to protect her people but Abby’s destruction off the chamber makes it meaningless since she never actually gets to make the sacrifice. Bellamy and Jasper’s part in the episode made for entertaining viewing. Jasper’s perspective being around living what is left of life to its fullest is interesting to explore around Bellamy who seems defined by regretting things that he can’t do anything about now. Jasper’s outlook could rub off on Bellamy. Kane and Jaha’s plot makes for another “last hope” but furthers them as characters. Kane just wants to be a good leader and telling Indra that she’s fighting for something that won’t exist in 10 days shows that he’s insightful enough to be an effective one. Indra on the other hand is struggling to see past her warrior ways. Jaha is becoming something akin to a religious leader of sorts which is interesting for the overall make-up of the show. Referencing Raiders of the Lost Ark and Lost is a nice touch as well and their efforts result in yet more hope for the doomed people.